Yesterday we learned that Apple was slicing in half the amount third-party developers need to pay in ‘app tax’ for some users. This is the 30% cut Apple takes from any subscription-based app like Spotify or TIDAL – a cut which these businesses say is the reason they charge $12.99 per month for subscriptions via their iOS apps but just $9.99 via desktop. Apple has now changed these rules, so that it will reduce this ‘app tax’ for any user who has been subscribing for a year or more. Spotify, though, says this is still deeply unsatisfactory. That’s not only because Apple’s own Apple Music is available for $9.99 on its App Store, putting at a price advantage, but because of what Spotify argues is a lack of transparency on the app store for third-party developers. “It sounds like a nice gesture to developers, but it doesn’t get to the core of the problem with the Apple tax and its payment system,” said Spotify spokesperson Jonathan Prince in a statement. “Unless Apple changes its rules, price flexibility is prohibited, which is why we can never provide special offers or discounts, and means we won’t have the ability to share any savings with our customers. 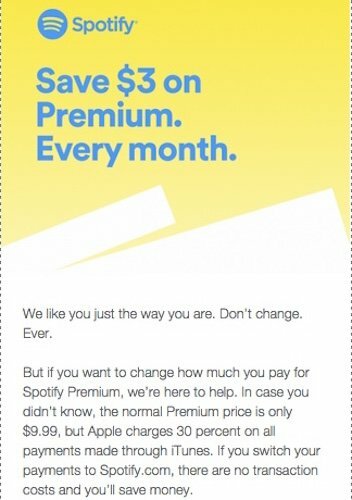 Spotify did not confirm whether it would be reducing its iOS monthly subs price in accordance with the new ‘app tax’ reduction. The Swedish company has previously encouraged its user-base to sign up via desktop and save $3 a month on the iOS app cost in an email campaign (see inset). Apple’s new ‘app tax’ rules come into effect on June 13.